Toast sesame seeds till aromatic n popped up , i did it in microwave . Break walnuts into small pieces and keep aside. Heat oil in a pan and tip the carrots in it , add salt and stirfry on medium heat till they change color but not cooked ( takes about 2 minutes), sprinkle the crushed jaggery , lemon juice and pepper powder and stir well on high heat now........the jaggery will get watery first and then it will coat the carrot pieces like caramel , glazing them ( takes another 2 minutes).........remove from heat. 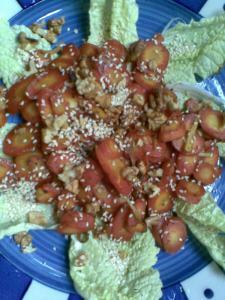 healthy meals leafy green salads salads these foods helped me loose wt. The dressing is tempting me to eat salad..Normally I always kept myself away from raw vegetables. But it seems if I continue to read your blog ( which I will do) I will be brainwashed thoroughly to start eating salads soon and have some health benefit. Love the idea of adding jaggery in the salad dressing. Looks healthy! Does look tempting..and healthy too!! Thats a whole lot of new idea for me...never had this kind of salad...sounds very interesting. A healthy salad to stay fit sounds like magical words to me. Absolutely love this recipe dear. wow, sounds like a really tempting salad! My favorite way of eating salads is also mostly without dressing or just a bit of olive oil-lemon juice-salt & pepper dressing. This one looks wonderful and perfect for these freshly in season winter carrots! thank you for stopping by mine to leave a comment, you have got a wonderful healthy blog too, lots of reminders to eat healthy, will come back often to pick up your healthy tips! !nice work! !